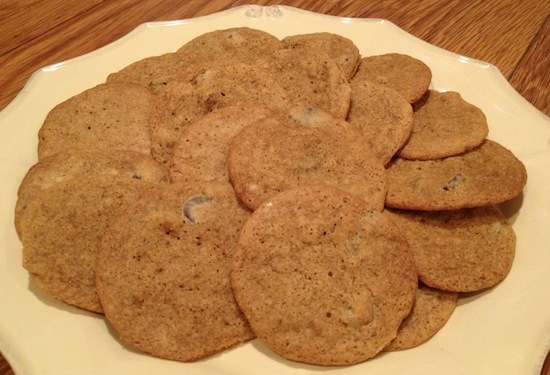 This cookie recipe, one of the world’s best, was used by Martha Stewart’s daughter Alexis, and are hence named “Alexis’s Brown Sugar Chocolate Chip Cookies” in Martha Stewart’s Entertaining cookbook. I have modified the recipe to reduce the amount of sugar, as it is possible to successfully reduce the quantity of sugar in any recipe by one-third without changing the outcome. We find the taste more agreeable too, as we prefer to avoid overly sweet baked goods. The high butter ratio creates cookies that spread thinly, and gives a toffee-like quality. The recipe makes 2-1/2 dozen large cookies or about 6 dozen regular-sized cookies, plenty to satisfy all – be forewarned, they will go fast! Preheat the oven to 375°F. (or 350°F Convect Bake cycle). Line baking sheets with parchment paper. Cream butter until smooth; add sugars, and mix until smooth, scraping occasionally. Beat in eggs and vanilla. Sift flour, salt, and baking soda. Stir chocolate chips and pecans into dry mixture, and blend with the butter-sugar mixture, using the paddle of an electric mixer (or mix by hand, the old-fashioned way). For 4-inch cookies, drop 2 to 3 tablespoons of batter onto the parchment-lined baking sheets. For 2-inch cookies, drop 1-inch mounds of batter 2-inches apart (approx. 12 per sheet). 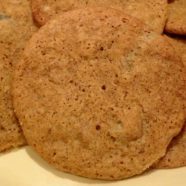 For chewy cookies, bake approximately 8 minutes, until center of cookies are set, but not too firm. For crispy cookies, bake 10 minutes until well set and lightly browned; do not allow cookies to become dark brown. Remove parchment sheet onto heatproof surface; allow chewy cookies to sit up to a minute before removing to a baking rack. Remove crispy cookies to baking rack immediately.